A while back I fabricated a socket adapter for my USBasp programmer for use with the eight pin ATtiny85 DIP package microcontrollers. 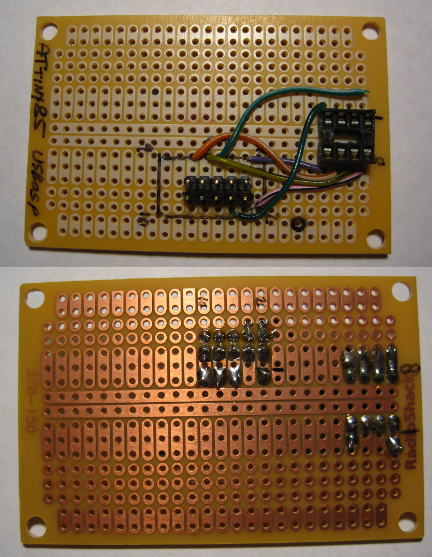 I used a RadioShack Catalog #: 276-150 prototype board, an 8-pin socket, some header pins and wires to create it. Simple, easy and it does the job. By the way, the Betemcu.cn USBasp programmer is readily available on eBay for under $9, including postage. It uses Thomas Fischl’s design and works flawlessly. However, when my activity included ATtiny84 and ATtiny2313 chips I was faced with the prospect of building new boards for each microcontroller type. 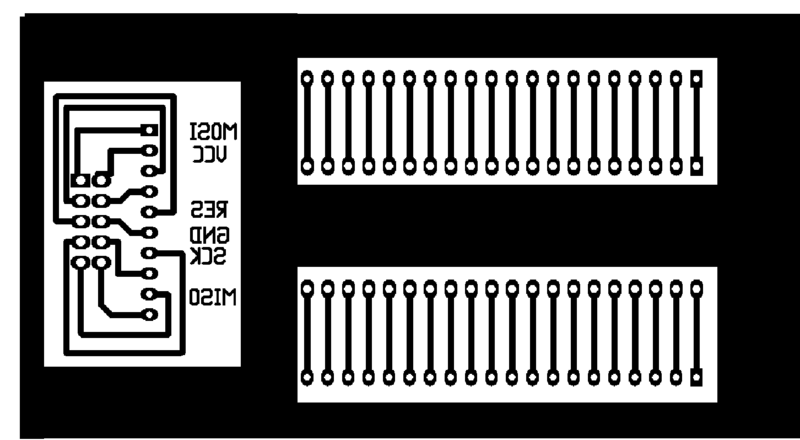 Instead, I opted for building a universal adapter that would work for all of the ATmel microcontrollers. I accumulated parts through eBay so as to minimize costs. 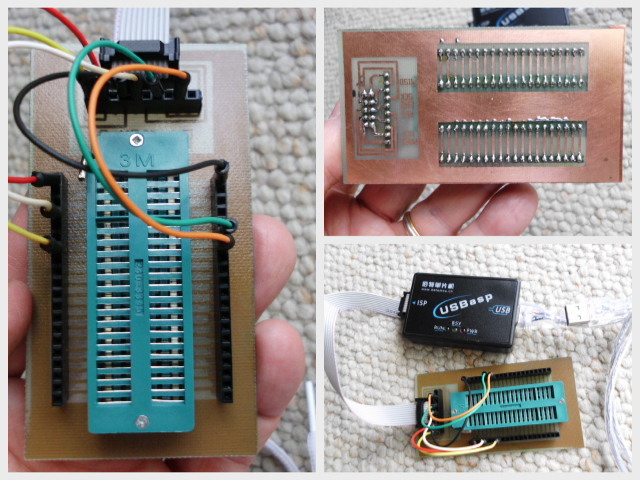 Most important was the 40-pin ZIF Socket for big or slim chips. It cost $2.95, including delivery. I purchased it from eBay vendor grand_sky. My single row male 1X40 header strips cost 20 cents each ($1.95 for 10) from eBay Hong-Kong seller wulor, but many people sell these. My 1×40 Pin 2.54 mm Single Row Female Pin Headers were 32 cents each. My single-sided PCB board material was ordered from eBay seller abcfab for 52 cents per 4X6-inch board. To design the universal adapter I used gEDA‘s schem and PCB packages. A Printed Circuit Board layout consists of applying upon a copper laminated board, an acid-resistant pattern that represents the areas that are to retain copper after etching in an acid solution (etchant). Areas of the copper laminated board that are exposed to the etchant will be dissolved away, leaving the areas under the acid-resistant pattern intact. The positive layout below is printed in reverse onto a special paper that will easily release the toner when heated. Laser printer toner is a finely ground polymer plastic that is fused to the paper by heat. The trick of the “toner method” is to get the toner to transfer from the paper to the copper laminated board once it is re-heated. There are several paper solutions for the “toner method”, some better than others. Regardless of the type of paper used, the process is to place the reverse image positive laser print with the toner touching the metal surface of a clean copper laminated board and then apply heat and pressure to loosen the toner from the paper, permitting it to transfer to and adhere to the copper laminated board. I used use a common clothes iron as the heat source, although a laminating machine designed for identification cards is successfully used with one commercial product. The laminating machine will not work with Brother brand laser printers because the toner’s melting point is too high for the laminating machine. With Brother brand laser printers you must use a clothes iron – although, I am considering a carpet seaming iron sold by Northern Tools and Amazon because it has a rectangular shape and higher controllable temperature. Once heated under pressure, the toner ends up adhering to both the paper and the copper laminated board. The paper/copper laminated board is then soaked under water and the waterlogged paper floats away if you use dextrin coated paper, such as that made by PulsarProFx. I also use PulsarProFx’s Green Toner Foil because the toner adhering to the copper laminated board is porous and, even though you cannot see it with the naked eye, there are sufficient holes for the etchant to penetrate the toner traces and remove metal that you do not want removed. The Green Toner Foil is ironed onto the copper laminated board resident toner, creating a smooth, impervious surface on the top of the toner traces, resulting in superior board etches. You can obtain a correct size copy of the etch pattern above HERE. My finished board is shown below. NOTE: Learn from my mistake and mount the ZIF socket with the handle facing away from the socket. 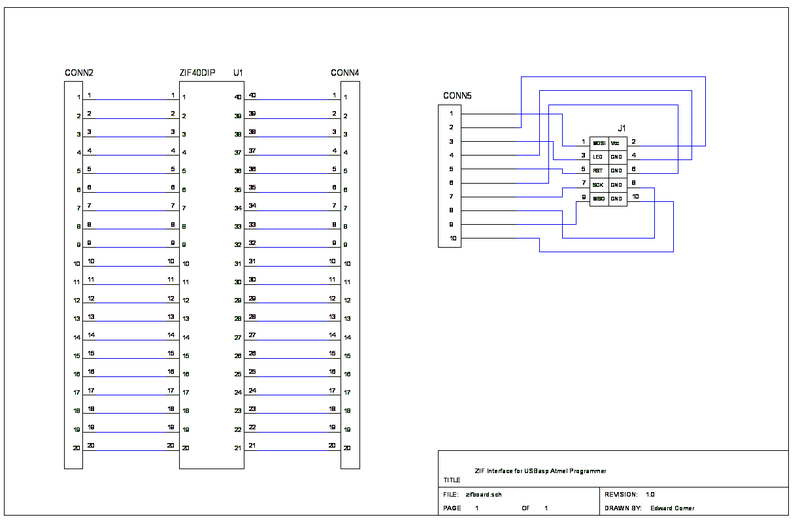 This entry was posted in Arduino, Electronics, PCB Etching and tagged Arduino, ATmel, PCB, USBasp. Bookmark the permalink. I designed new version of USBasp to simple use. my USBasp auto detected all AVR chip, just insert AVR chip’s from pin 1 of ZIF socket, without any jumper or switch setting. my AVR USBasp programmer generate clock on ZIF socket and ISP connector to XTAL1 pin of AVR, and user don’t worry about wrong CKSEL and CKDIV8 fuse bits setting. I named my USBasp to SANA (it’s mean in Persian Language : Simple and Easy). I don’t normally approve spam comments but this commenter’s product looks interesting. I have NOT tried it. It appears that he is located in Iran and given today’s political environment I recommend checking for customs restrictions prior to ordering one. I love electronic and need money for develop an MKII ISP with ZIF socket same SANA USBasp and new MKII ISP can program 24CXX, 93CXX, 25XXX and 26XXX EEPROM. Sadly Hossein you do not ship to my country. I can pay easily by PayPal but you didn’t answer my request?? The Netherlands. By-the-way, I know a friend in Iran (named Behzad through site Jestine Yong) if that helps. But I haven’t asked him about it. Yes I can send Programmer to your country. And I can send to you via your friend “Behzad”. Hi Hossein, my Iranian friend Behzad just bought one Sana programmer. Apparently you won’t sell to The Netherlands since you didn’t reply to my last post? Is it possible to buy a DIY kit in the form of schematics and pcb and or hex code instead in that case? So I can build one Sana programmer myself? I like to use the Sana with my BASCOM-AVR program because of the ease of use. I send my programmer after complete testing. So I can’t sell a DIY kit. I think, After receiving the first my programmer; you can be purchased in DIY kit form. Thanks for your possitive reply Hossein. I do not need any kit OI only opted the possibility if shipping is a problem. I am happy to buy a SANA ZIF socket universal AVR programmer from you! Please tell me what I have to pay including shipping to The Netherlands ? you must pay 10 USD for IR-POST. Sana programmer with Included USB, ISP kabel, cd rom with demonstration videos, and nice storage bag is a real bargain for the price asked at only $15 plus $10 shipping! Thanks for sending me this nicely created and build Sana Programmer!. Just tested the small but great Sana with USBasp driver in BASCOM-AVR. It worked immediately after connecting it to my PC! I’m impressed! Also because the Sana can recognise and program even more chips than only AVR and also can be used on different systems! Why I think it is a must have for anyone who needs a good and easy AVR (almost universal) programmer!